Our sole purpose is to create an authentic gelato and dessert experience that keeps our customers coming back and recommending us to their family and friends. It doesn’t happen by accident. Here’s what we do to make sure there’s quality in everything we do. Gelato Cimmino is so much more than just a scoop of delicious gelato, it’s an entire experience. 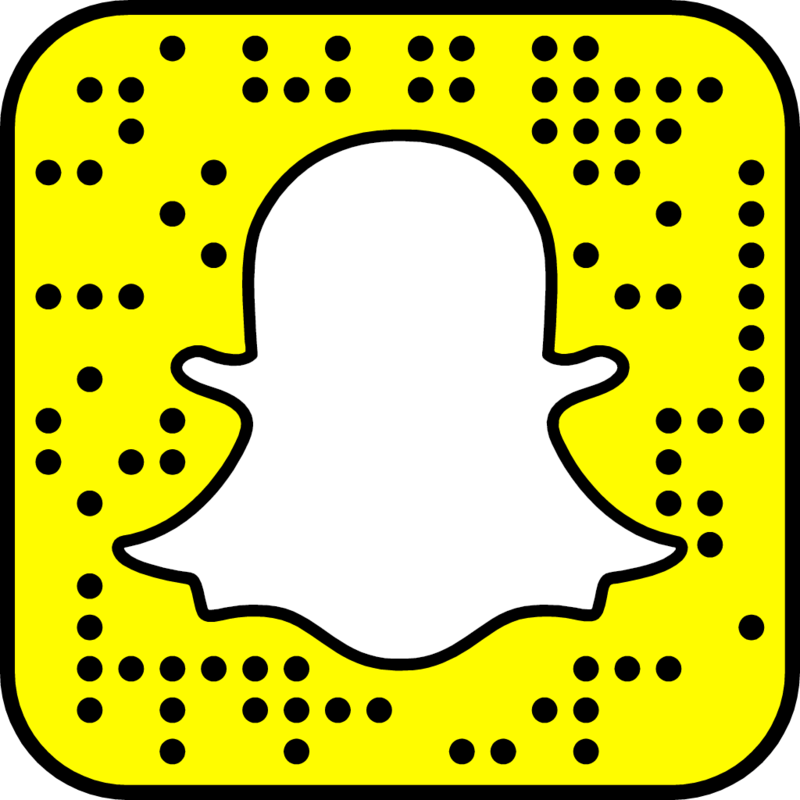 Every bit is dedicated to bringing and sharing our story with you. We stick by our values because we know that compromising on our customers just wouldn’t taste as good. 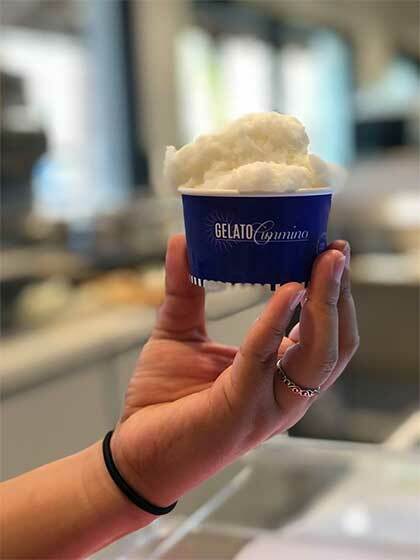 Our store is guided by producing the real Italian gelato, using premium ingredients, and authentically sourced flavors wrapped up in the creamiest treat for you to enjoy. When we say authentic Italian gelato, we’re not just talking about the steps in preparation. The authenticity doesn’t just mean working with recipes for us, it’s also working with the ingredients sourced from the mediterranean gem itself! Fresh, all natural ingredients sourced from Italy are what make our gelato unique and delicious. Some of our tastes and flavors come from the shores of Italy itself like our toasted hazelnuts from Giffoni, or wholesome walnuts from Sorrento. Gelato’s texture and ability to bring in flavor from other ingredients relies distinctly on the milk used in production. That is why we choose the finest milk for our gelato creations. The basis of our creations must be up to the same standards we hold our imported ingredients from abroad. We believe this high standard of quality is what gives our gelato the extra umph for you and other happy customers to enjoy! Ice cream is a treat, and our place reflects that feeling of taking time out of your day to enjoy our culinary perfection. Our dream was to bring the very best gelato from Italy to American families so they too can enjoy the delicious, refreshing treat. 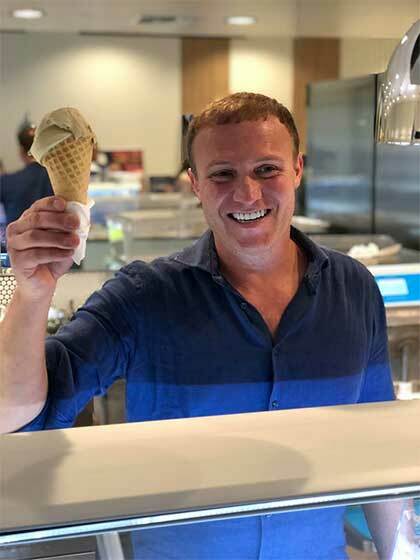 Owner Mario is dedicated to bringing the joy gelato inspired all throughout his own childhood, and the store is just the place to spark that joy and relax. Let our gelato transport you to Italy! Our recipes are inspired from the joy and childhood of gelato aficionado Mario. Here you can taste favorites such as strawberry, vanilla, and chocolate. Looking to venture out? Pick up our signature Cimmino Rock, or Amarena Cherry. To top it all off, our creations come to life in front of your very eyes. Let the perfect blend of silkiness and creaminess carry you away for a minute or two. It’s not just gelato here either. Italy is widely known for its long lasting love affair with coffee, and we’ve brought the drink to your door. Order up a Caffe’ Affogato, (gelato with coffee poured over the top) and Caffe’ del Nonno (creamy coffee gelato with a mix of other flavors) to try something new. We’re dedicated to bringing you a sweet treat that will light up your face. See if something on our coffee menu catches your eye !